I’m not sure I want to call Nietzsche a religious thinker, but cannot help but feel that his thought as a whole and Birth of Tragedy, in particular, are steeped in religious categories, religious consciousness, religious dreaming. Ritual, the art of ritual, especially dance, is an integral part. Citing Lucretius, Nietzsche identifies the first appearance of the gods in dreams and glorious figures (section 1). Dancing gestures, the Dionysian dance, the Christian dances of St. John and St. Vitus as well, enchant. Animals speak, the earth yields milk and honey, supernatural sounds emanate (section 1). Tragic religion is vision of the god, the redemption of “man,” and the world’s transfiguration. 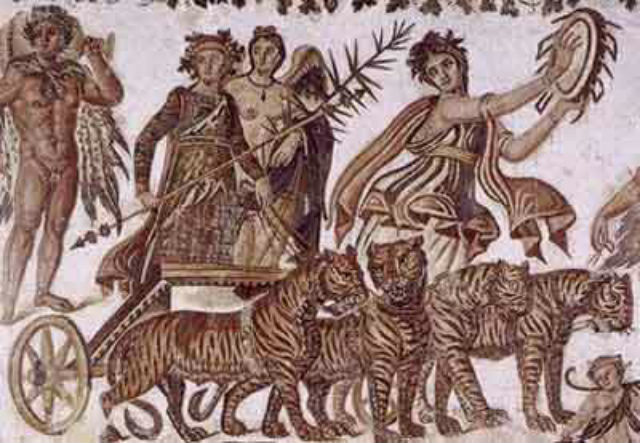 At the height of magic transformation, the Dionysian reveler sees the god, his Lord Dionysus (section 8). A good Lutheran, Nietzsche wants his readers to believe, to believe in Dionysian life and miracles, the power of tragedy to heal, the falling away of individuated consciousness and then its restoration to Apollinian form. Christian-all-too-Christian. The violation of the law by Oedipus spreads higher magical circles in founding a new world on the ruin of the old. Sharp and gruesome points are sharpened. “That is what the poet wants to say to us insofar as he is at the same time a religious thinker” (section 9). Like some titanic Jesus Christ, the tragic hero takes upon his back the burden of the world on himself, relieving us of the burden and reminding us of higher existence (section 21). That indeed is Nietzsche’s leap of faith, this belief in nihilation as ecstasy and the promise of transfigured existence. This entry was posted in uncategorized and tagged Christianity, God, Nietzsche, religion. Bookmark the permalink. If the Greeks and Persians had religion, Nietzsche is a religious thinker he loves Zarathustra and the pagan gods, and is caught up, as you so eloquently lay out, in transformations that are echt religious. comes ringing through even in his untimely disciples like Felix Guatarri, hard to read those those folks writing about how our lives/institutions could be re-vitalized and not hear Emerson’s divinity school address (sermon really), I do think that this is part of what Foucault left behind (with some help from Derrida and others) after his earlier work on madness and all even as he turned to some explicitly religious practices/disciplines, they tended not to be of the ecstatic kind. In some ways Al Lingis might be the heir apparent in our times, yes/no? What happens when Orpheus comes to town for real, descends into the under-world of the world-Mummery, and thoroughly examines the entire Great Tradition of humankind at a profound depth-level.